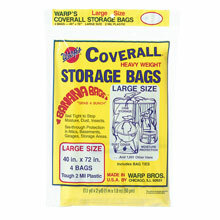 5 Coverall Heavyweight Plastic Storage Bags - 36" x 60" - 2 mil. 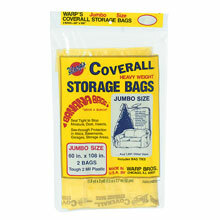 4 Coverall Heavyweight Plastic Storage Bags - 40" x 72" - 2 mil. 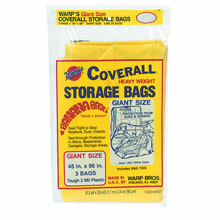 3 Coverall Heavyweight Plastic Storage Bags - 45" x 96" - 2 mil. 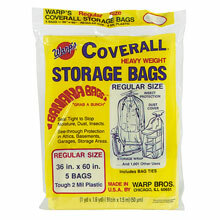 2 Coverall Heavyweight Plastic Storage Bags - 60" x 108" - 2 mil. Coverall oversized items for storage. Great for outdoor storage of furnitue against against moisture, dust, and bugs. Clear/Opaque - .35 - 2 mil. 9' x 400' - .35 Mil. 12' x 400' - .35 Mil. 10' x 20' - 1 mil. 8.33' x 200' - 1.5 mil. 8.33' x 200' - 2 mil. 36" x 25' - 4 mil. 36" x 75' - 4 mil. 48" x 25' - 4 mil. 48" x 75' - 4 mil. 48" x 25' - 8 mil.